Do you want to create a classy and sophisticated atmosphere for your event? A string quartet is a fantastic choice. 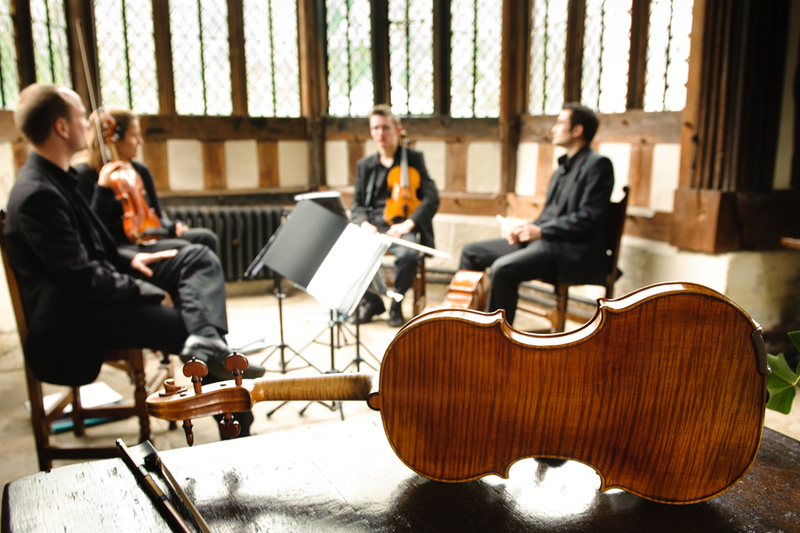 Versatile and adaptable, a string quartet is ideal for all manner of occasions. From dinners to product launches to brand promotions – strings suit them all. However, when we think about a stringed foursome, it is normally a wedding string quartet we think of. Why is a wedding string quartet so popular? There are many reasons! The soft, seductive sound of strings is the perfect soundtrack for the signing of the register, the ceremony and the wedding breakfast. A wedding string quartet can be centred around the ceremony itself. Equally, the music they produce is fitting at various points throughout the day. Here are our handpicked selection of wedding string quartet Silk Street acts. Enigmatic Strings can adapt their performance to cater for traditional and modern tastes. The arrival of guests, entrance of the bride and signing of the register are all taken care of. Trio, duo and solo violin options are also available. This act are highly trained, professional and experienced musicians. There is a misconception that string quartets only play classical music. In fact, they can play uniquely arranged pop music. Click on the video above to hear Enigmatic Strings play the latest hits, including Ed Sheeran. Enigmatic Strings are great for Bollywoood themed weddings. They have a wide Bollywood string repertoire and can dress in traditional Indian clothing. If you want an adaptable act, look no further than Aggraziato Strings. This quartet provides a beautiful musical backdrop to the wedding ceremony. Furthermore, Aggraziato Strings will draw your guests onto the dancefloor and will finish the night off with a flourish. Soulful and emotive music is the order of the day with this act. They can also switch from acoustic to electric if required. Traditionally, back in the day, a wedding string quartet was always acoustic. These days electric strings can amplify the music. This is ideal for very large weddings and gives more control over the volume. And it’s a great way to make an impact walking down the aisle or as you enter the reception. Another highly versatile act, Ristretto Strings are ideal for corporate events, summer garden parties and any celebration – as well as weddings. The act set an atmosphere of sophistication for the big day. They are the perfect accompaniment for the entrance and exit of the happy couple. Additionally, the act are ideal for the signing of the register, and more. As an acoustic act, Ristretto Strings are mobile and perform in any room, hallway, patio or lawn. Moreover, they can play as an electric quartet too if needed. The beauty of a string quartet is their versatility. They can lead you down the aisle and soundtrack the wedding breakfast. As music is usually read from sheet music, the performance is perfect every time. However, a wedding string quartet can dress accordingly to blend into the style/theme of a wedding. They can dress in white jackets, black DJs, or smart suits and dresses. Therefore, a string quartet can match any theme. Get in touch today with our team if you are interested in adding some elegance to your wedding day. Want to chat about hiring a wedding string quartet? Just click the live chat button a sure fire way to get some great ideas right now. If you have another event in mind, we can give you some friendly advice and personalised recommendations.